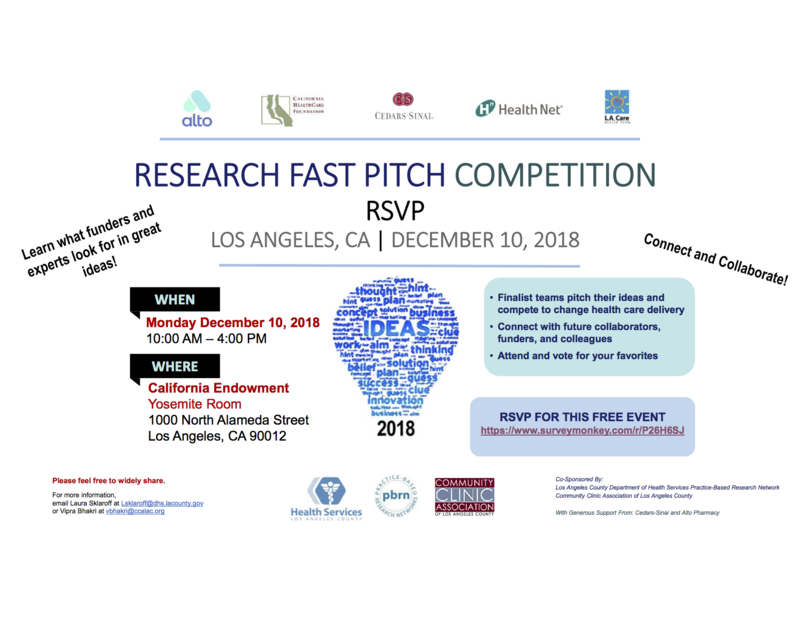 The Los Angeles County Dept of Health Services and the Community Clinic Association of Los Angeles County are sponsoring a free networking event on Dec 10 focused on research, grantsmanship, and health care innovation for the safety-net: the 2018 Research Fast Pitch. This event is a mix of the TV show, “Shark Tank” meets the grant making process. Seven teams will pitch their innovative ideas to impact health care to a panel of judges who represent grant making organizations, including the California Health Care Foundation, Health Net Community Benefit, Cedars-Sinai Community Benefit, and LA Care. Ideas being pitched range from technology focused on diabetes care and management, methods of addressing toxic stress in foster care children, increasing usage of PREP in at risk populations, and the impact of music on the health of people who are homeless. We typically have more than 35 organizations from the Greater Los Angeles area attend so this is a great chance to network with other safety-net providers and NPOs while learning what funders look for in health focused research work – and we hope to see you there!